More than two years ago, seeking to revive a moribund economy, the European Central Bank (ECB) embarked on a new monetary policy measure: charging interest on excess liquidity that banks held at the central bank. The move complemented a series of other easing measures aimed at bringing inflation back to the ECB’s price stability objective of below, but close to, two percent over the medium term. A negative policy rate makes sense. When commercial banks are charged (rather than remunerated) to deposit their excess liquidity at the ECB, they should be more inclined to lend to consumers and companies. Consumers would then buy more goods, and companies would invest in new productive capacity. Faster economic growth would help prevent inflation from sinking too low—or even becoming negative—which is a sign of economic malaise. For a long time, many economists and policymakers believed that central banks could not cut the policy rate below zero. If they did, the argument went, commercial banks would have to respond by charging their own customers for deposits. As a result, companies and households would start withdrawing cash and stash it under the proverbial mattress ( Bech and Malkhozov , 2016). But not going below zero percent meant that so-called real interest rates—nominal rates minus inflation—could not fall further when inflation was too low. And real interest rates that were too high would hold back investment and consumption. In fact, in the euro area, real rates were likely still well above the rate required to raise output to its potential level (technically, the “natural” rate of interest). So, to push real rates lower, the ECB would have to cut the nominal policy rate below zero. What has been the track record of the ECB’s negative rate policy—also adopted by other central banks, notably in Japan and Switzerland—after two years? Our paper finds that, so far, it has been successful. The rate cut has eased financial conditions, reducing the cost of borrowing for both banks and their customers ( ECB , 2016; Heider and others , 2016). Lower funding costs for banks have also strengthened the ECB’s “forward guidance,” meaning its commitment to keep rates low for an extended period. Lower borrowing rates for both households and firms have also contributed to a modest credit expansion—favorable to growth and inflation. Finally, the ECB’s deposit rate cuts have helped amplify the impact of its asset purchases, which are intended to spur markets and the economy. That is because banks have reduced their cash balances and instead invested it in riskier, but higher-yielding, assets. 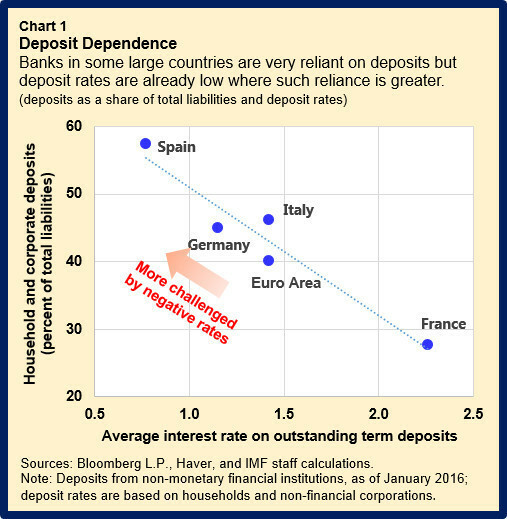 However, there are unique challenges to negative rates in the euro area. Since the ECB charges interest only on excess liquidity, the charge is greater in those countries where banks hold large excess reserves. These are generally countries with substantial current account surpluses vis-à-vis other members of the monetary union. At the same time, banks’ ability to generate interest revenues for each euro of assets has suffered because their reliance on a wide deposit base has prevented them from cutting the amount they pay for customer deposits as much as that they charge for loans. And in several large economies, loans are typically indexed to the policy rate (so-called “variable rate loans”). 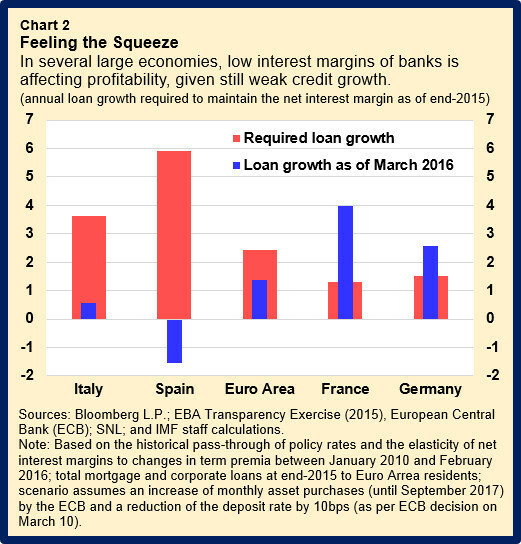 Banks in these countries face reduced margins not just on new lending, but also on existing loans, as discussed in the IMF’s April issue of the GFSR (Chart 1). To some extent banks have been able to mitigate the squeeze on profitability with higher lending volumes, lower interest expenses, capital gains from investments, lower risk provisioning, small increases in fees and commissions, as well as savings from cost cutting ( Rostagno and others , 2016). But there are clearly limits to such mitigation measures. Overall, the ECB has limited room for further substantial rate cuts without hurting the profitability of banks. As outlined in our paper and in the IMF staff report on the euro area , the prospect of prolonged low policy rates has clouded the earnings outlook for most banks, suggesting that the benefits from a negative interest rate policy might diminish over time, while future lending growth may be insufficient to offset declining interest margins in some countries (Chart 2). Further policy rate cuts could bring into focus the potential trade-off between effective monetary transmission and bank profitability. Lower bank profitability and equity prices could pressure banks with slender capital buffers to reduce lending, especially those with high levels of troubled loans (Charts 3 and 4). Therefore, looking ahead, the ECB may need to rely more on purchases of assets. Additional rate cuts could weaken the effectiveness of monetary policy if lending rates fail to adjust or customers withdraw cash from banks. Focusing on asset purchases would raise asset prices and aggregate demand, while also supporting bank lending. This would also facilitate the pass-through of improved bank funding conditions to the real economy.